There’s a fever sweeping the backcountry adventure community. I know where I caught it, and I know when it sank its claws deep into me. This is the story of how I caught the bikepacking bug. At the end of last season my friend Brandon sent me a link that described the Cross Vermont Bikepacking Trail, and told me he was interested in checking out some of the course. I happily agreed to tag along, not really understanding what that might encompass, but interested in the adventure nonetheless. Then, during my yearly pilgrimage to the Adirondacks with Brian this summer we made our usual stop at the mountain biking playground that is Mike and Jody’s. While we spent another afternoon dancing around their amazing trail system, Mike regaled us with stories of The Adirondack Trail Ride (“TATR” for short). 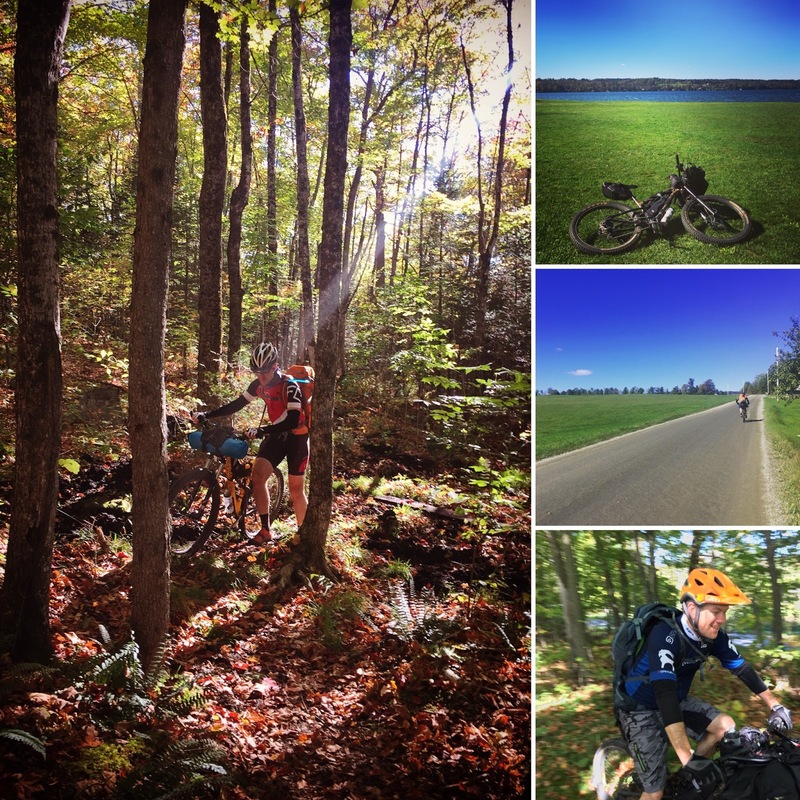 The TATR is an annual multi-day self-supported 550+ mile “race” around the Adirondack park mixing roads, singletrack, logging and snowmobile trails. Mike was into his third year of this particular form of insanity. Jody had also clearly caught the bug. Each of them had set ambitious goals for this year’s iteration- including Jody’s goal of setting the women’s record for a grand-depart participant. Mike showed us his bikepacking rig, a tricked-out Trek Stache, and we discussed some of his gadgets, insights and advice that were hard-earned on his two previous years of riding the course. 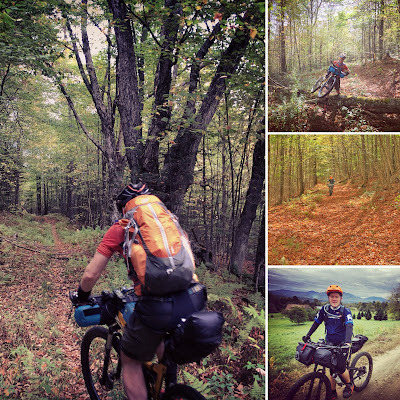 Mike also pointed me to his blog, which had some decent information on putting together a bikepacking setup, as well as stories from his adventures. Mike and Jody’s enthusiasm was infectious and come September I followed the race closely on LiveTracker ,celebrating as they both met their goals: Mike beat his previous time, and Jody set the women’s grand-depart record, shaving five days off her previous mark. Over the summer I also started to put together my own bikepacking setup- borrowing heavily from Mike’s experience and recommendations. I obtained a framepack from Defiant Packs, and a bevy of bags from Revelate Designs. I strapped these onto my Rocky Mountain Sherpa, which I modified by adding an Alpkit Love Mud Confucious handlebar to give extra space for tethering handlebar bags and gadgets. I also invested in my first hammock, purchasing a Hennessy Hammocks Asymmetrical Expedition Zip, and added some quick set-up/breakdown modifications including the snakeskins, webbing, and repel rings. My choice of a hammock over a tent was a bit risky, given the fact that I had never even slept in a hammock before. Knowing that my daily-use hydration pack wouldn’t be big enough, I also invested in an Osprey Manta 28L hydration pack. Given my positive experience with their hydration reservoirs, I was hopeful that the backpack would be similarly well-thought out and constructed. I also carefully developed a route for my first bikepacking trip. All I needed was a window of time to get away for a couple days- a difficult task for anyone with two small kids. Finally in late September my merciful wife threw me a bone by agreeing to watch the kids solo for a weekend. I convinced Brandon to join me on the adventure; an easy task given his unabashed love of impossible sufferfests. As our drop-date approached, however, the forecast for my target destination soured, and suddenly we were faced with the prospect of two days of rain showers putting the damper on our bikepacking adventure. Cold, wet, and inexperienced is no way to start your bikepacking career, so I whipped up a couple other alternate routes around New England, hoping one of the spots would avoid the rain. 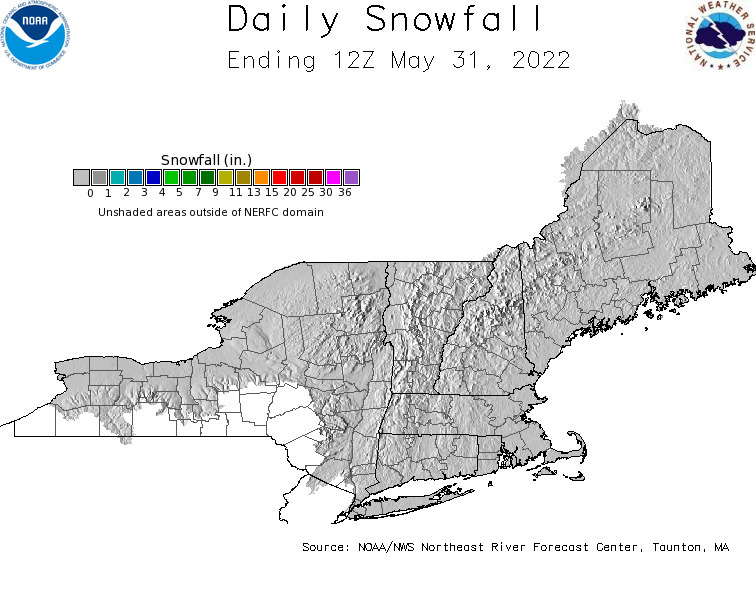 Finally, the weekend arrived and the least miserable weather was forecast for Northern Vermont. The trouble was that none of the routes I had developed were that far North. Necessity was mother of invention, and within a few hours I had mapped out a route that took us across a wide swath of the Northeast Kingdom. 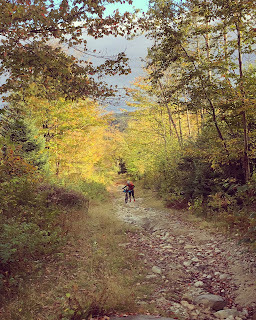 The route incorporated some of my favorite trails at Kingdom Trails, dirt roads, powerline trails, snowmobile corridors, wooded singletrack, and the ubiquitous Class IV roads that crisscross the rugged mountains of Northern Vermont. A veritable Kingdom Sampler awaited us. Adding to the anticipation, virtually everything was untested: the route, my packs, the hammock, and even my food choices were new. It was high-noon by the time our flatlander asses landed at our launch point near the Victory Hill trails on the backside of Burke Mountain. Fellow NEBC’er Justin couldn’t ride with us, but graciously shuttled us to our start. He also promised to come rescue us if we needed to pull the plug. Although it had rained lightly all morning, the sun poked through as we set out lifting our spirits. With mostly cloudy skies and temperatures in the mid-fifties, the weather was nearly perfect for a day of biking. The first few miles of our course followed the Gold Trail, which I knew from the two times I had ridden the Circumburke Trail Ride. By coincidence, the Circumburke was scheduled for the following week, which probably contributed to the excellent condition of the trail. A long spate of dry weather also helped eliminate much of mud that I recalled from previous rides. We rolled steadily along on the playful single and double track through Victory and around Burke Mountain to Kingdom Trails. Our route took us up onto MacGill Field and to the top of Moose Alley- one of my all-time favorite trails. At the very top, I learned one of my first important lessons about the bikepack setup. As I started down a steep rock face I instinctively moved my body back and down to get behind the seat, but because of the seat bag I couldn’t get back. I also couldn’t lower the dropper post given the lack of clearance between the bag and the wheel. I desperately tried to get as low as possible to keep from flying over the bars, and just barely avoided disaster. From Moose Alley we rolled along White School to East Burke Village and up to Darling Hill. From there we hit more of my favorites including Poundcake and Fenceline. The twisty, technical singletrack helped me get a feel for how the Sherpa handled while fully loaded. I was immensely pleased. Aside from the issue with the steep descents, the bike handled amazingly well. It didn’t feel top heavy or unbalanced. It held a line on the banked corners and didn’t throw weight unpredictably. Everything stayed centered and low. This was what also caused an annoying amount of "pedal bang" when I had been breaking in the bike near Boston. But it was a welcome trade-off for the ease at which it carried the gear and nimbly danced around the trail. From the far northwestern corner of Kingdom Trails we started a long road climb. After less than a mile of pavement we rolled onto a dirt road that carried us up onto a ridge where we were treated to beautiful views of the open rolling hillsides surrounding us. To our West we could see a high forested ridge with wind turbines spinning in the brisk breeze. Through a gap just below the ridge a powerline cut a swath through the forest. I wondered aloud if that was where our route cut westward. Our dirt road ride continued most of the afternoon through Sutton and Sheffield, as we rolled by large active farms, and eventually into a wooded valley with houses tucked now and again back into the trees. The route eventually took us off of the dirt road and onto a gated Class IV road toward the turbine adorned ridge. Fairly quickly, however, we came to a fork, with one arm running uphill and westerly and another steeply downhill and southerly. My GPS route followed neither. With doubt about which way to go, I chose to climb, following a glorified stream bed up onto the ridge- much to the dismay of Brandon. My thinking was that if we had to retrace our steps, I would rather do it downhill than have to climb back up. After climbing a short distance on the rocky trail, it became clear that it was headed in the opposite direction of our route. And so we retreated back downward, following the southerly branch until the woods opened up around us to reveal a large powerline- the one I had seen from the road hours earlier. It was a typical powerline sufferfest. It had a rough ATV quality doubletrack and presented the full menu of usual suspects you find on a powerline slog: mudholes, swamps, overgrown brushy sections and unrideable rocky climbs. At the top of the last of these climbs we eventually dumped back out onto a road, and a long descent that eventually crossed under the interstate through two culvert tunnels. The crossing looked very familiar to me, and I realized that a nearby gravel pit had been the scene of a number of high school parties in my youth. It brought back pleasant memories of bonfires, cheap beer and sleeping under a tarp tied to the trunk of my friend’s car. On the far side of the interstate we headed north again. Soon the road became less and less maintained as we rolled alongside a large pond and through old hardwood stands. I could feel my legs burning as we continued to climb upward, and the light was starting to fade in the late afternoon air. I was getting nervous as we were getting close to a section of the route that I had mapped with some hesitation. The map showed a trail through the woods, and I could see from the Strava Heatmap that it had been travelled, but the lines were faint. I had learned on other adventures that sometimes the heatmap would show where people had ridden snowmobile trails in the winter, but those same trails were a completely impassible swampy mess during other seasons. 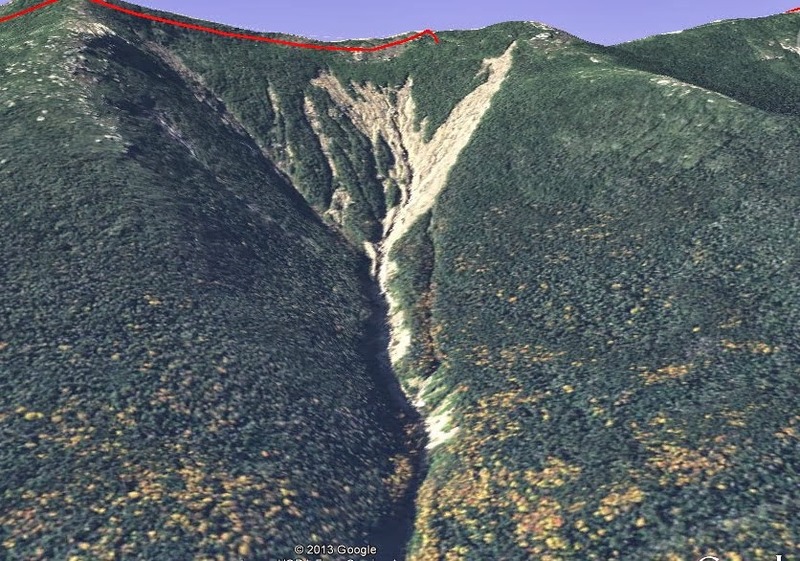 This route passed perilously close to some ponds, and screamed: “winter trail” to me. Just then, a sudden “bang” snapped me back to the present as a large rock kicked up by Brandon’s rear wheel impacted with the back of his bike. I saw it out of the corner of my eye and immediately thought it was trouble. Fearing a broken frame or a severed derailleur we stopped, but couldn’t find any damage. Crises averted. For the moment. We still had another fifteen miles to cover on my ambitiously planned route before reaching our intended destination: Craftsbury. I had been reading about the trails around the Craftsbury Outdoor Center, as well as their outrageously good food, and had wanted to check them out to start our second day. But we were far short of our destination with fading light, and with the looming obstacle of the untested trail ahead. My GPS breadcrumb trail suddenly veered into the woods. As we sat on the road, we couldn’t see any signs of a trail. I even rode a few hundred yards further, looking into the woods for any hint of a trail. We found only a few large granite slabs- the kind placed at a trailhead to stop a car from driving onto old logging roads. But high grasses and weeds hid any signs of passage. There was nothing else to indicate that there *might* be a trail lurking underneath. And so it was going to be a bushwhack. I rolled in, sniffing around, and followed what could have been a game trail, or was it the path? As I rolled further into the woods, what looked like it might be a depression in the leaves wound its way into the forest. I called to Brandon who reluctantly followed me into the woods. The “path” was more of a hike-a-bike, climb over trees, and through bushes obstacle course, than a “let’s relaxingly roll through the forest” track. After a few hundred yards I spotted blue ribbon tied to a tree and realized that the path was marked. But was this a hunter’s trail or was it going to lead us to the road on the other side? Or would it end in some impassible swamp? Darkness was closing in. Brandon gave me a look like, “Really? This is the route you picked? Really? !” Stuck on a barely visible trail, in the fading light of dusk, we carried our bikes up out of a small gully and onto the top of a knoll. And that is when we saw it- a lone boathouse tucked in the woods on the edge of a pristine pond. And in that moment my perspective changed: both of our situation and of bikepacking as a whole. It suddenly occurred to me what bikepacking was all about. Having carried our camping gear we were free from the tether of our car and correspondingly to any planned destination. We didn’t “have to” get to Craftsbury that night. We didn’t have to get anywhere that night. We could stop wherever we pleased, and there was no better spot than the one we had unexpectedly stumbled upon in the middle of our bushwhack. 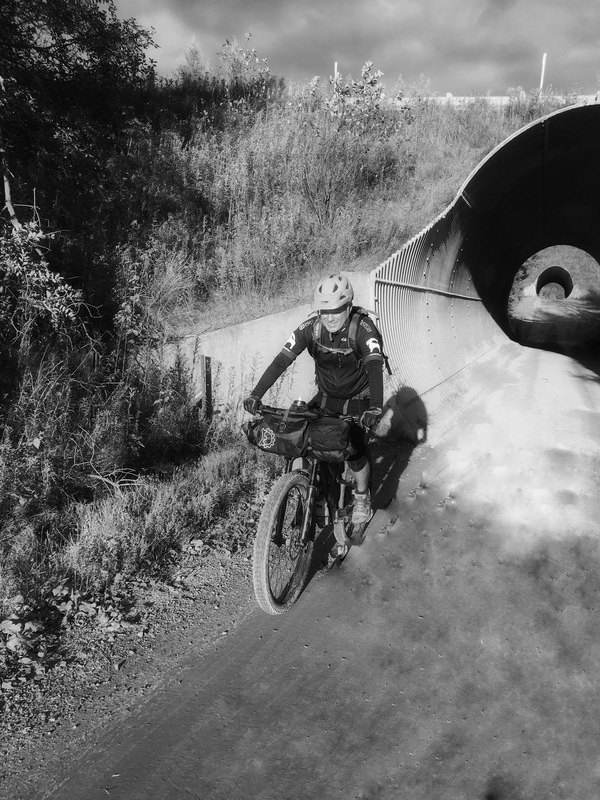 This was what bikepacking was all about. The freedom to stop and setup camp virtually anywhere. The apprehension I had been feeling all day, the pressure to reach our destination, the worry about our bushwhack- all left me in an instant. We were free to cut our day short, or go further than we had originally planned. It was in that moment of that realization that I became hooked. The fever had caught hold of me. The funny thing was that Brandon seemed to reach the same conclusion at the same moment, and with almost no discussion we agreed that this was the place we needed to stay for the night and set about preparing camp before daylight faded away. As we cooked our dinner, the skies cleared overhead and brilliant red, pink and orange hues lit up the edge of the pond. Clear skies also meant cold skies as darkness finally descended around us. For dinner I put a little heated water, some of my cheese and summer sausage into an Uncle Ben’s Ready Rice and Beans, I downed a hot-chocolate and retreated into my hammock for the night. I was pleasantly surprised with the hammock sleeping experience. Once you get past the initial difficulty of getting into a sleeping bag while in a hammock, the sleeping is immensely comfortable. It naturally keeps your legs high, and lying on your back or your side is easy and comfortable. Typically when camping I have to continually roll around to keep my hips and back from getting sore. But because you're off the ground in a hammock, there's no pressure on your hips and back. My hammock setup included a Hennessy Hammock Radiant Double Bubble Pad that was essential on such a cool night. Although it says it works down to 40’F, I was able to sleep comfortably as the temperatures dipped into the high 30’s. I had a 30F bag, but also a Thermolite Reactor Liner that adds about five to ten degrees of comfort. I awoke only once in the early morning hours when an onerous odor announced that a skunk was lurking close nearby. Aside from the gentle rhythmic “whump” of the nearby turbines, the only other sound to break the night air were the occasional hoots of nearby owls. We both awoke late and climbed out of our shelters when the sun had warmed the morning air. I heated powdered milk, to which I added granola, coconut and sugar and scarfed them down with some atrocious instant coffee. A light mist rose from the pond in the cool morning air as we talked about the day’s upcoming adventure. We decided to save Craftsbury for another day and start heading southwest to pick up the trail near Greensboro. After fixing a loose rear axle on Brandon's bike- likely caused by the rogue rock the day before, we set out on our route. The trail we had stumbled along the night before improved almost immediately as we departed the campsite, and changed from mostly unrideable to somewhat rideable as we rolled across a steep hill and down to a larger pond. After passing by summer camps we finally rolled out onto the road on the far side. A long descent down a paved hill brought us by another memorial of my young adult years- the Bread and Puppet center. I described to Brandon how tens of thousands of people used to descend through the unassuming barnyard, into the pastures and onto a natural amphitheater to watch giant paper mache political puppet shows. After a short jaunt on Route 16 and past the Everyday Museum we started a climb on a leaf covered Class IV road up onto the ridge above. More country roads along a high ridge eventually led us past the doorstep of the Hill Farmstead brewery. Unfortunately, as it was a Sunday, it was closed. Undeterred, we descended down into Greensboro and bought some bread and freshly cooked chili to add to the summer sausage and cheese I had packed for the trip. We ate our lunch, basking in the sun on the green in the center of town. After lunch we rolled up to Caspian Lake where they had public restrooms- open even this late in the season. The wind was ripping across the lake, but the skies were crystal blue, and the sun was warm on our backs. We climbed a paved road up and out of town, and eventually rolled onto the historic Bailey-Hazen road for a spell. This eventually descended into East Hardwick where we turned onto Route 16 once more, and crossed the Lamoille River. Again we quickly departed the busy Route 16 and embarked on the hardest climb of the weekend: a half mile slog to the ridge on the other side of the river. Near the top of the climb we caught a glimpse of an old abandoned railroad bed which we eventually skirted onto for the balance of our ride to Joe’s Pond. The railroad bed was lined with large chunks of gravel, and a few inches of grass that smoothed over the harsh bumps. Thankfully it had been mowed, and was well maintained by the snowmobile clubs that use it as superhighway during the winter. We cruised along quickly, making good time on the wide open corridor. Just before the Walden-Cabot road, the snowmobile trail turned off of the railroad bed, and the character of the trail immediately changed. The next 100 yards were a jumbled mess of burdox and felled trees. A missing bridge revealed why the snowmobile corridor had departed- and so we finally rolled off the raised railroad bed and down to the road. With the taste of a full-on bushwhack still in our mouths, we ventured onto the Walden-Cabot road to where the rail corridor crossed, so that we could get a look at the start of the next section that led the next few miles to Joe’s Pond. High grasses, blowdowns and the lack of any discernable path suggested that this was going to be another slog for the remaining mileage to Joe’s. With many miles on our legs we opted to skip the schwack and ride the road until it crossed the Lamoille Valley Rail Trail at Joe’s Pond. This added some climbing, and couple miles onto our route, but it was an easy tradeoff as the road into Joe’s Pond provided beautiful views of the landscape of the high plateau surrounding us. Just before the intersection with Route 2, we noticed that the well-developed rail trail had begun in earnest, and so we skirted down, and onto the hard packed bikeway. From there it was essentially a twenty mile descent to St. Johnsbury. This was the perfect end to a long weekend of riding. We rolled through old hardwood stands, deep crevasses with mossy rock walls and along emerald green pastures with amazing views of the White Mountains. We quickly descended through Danville and toward St. Johnsbury. Justin’s wife, Kate, met us on the trail and we joined her and Justin for beers and snacks on their patio, recounting the weekend's adventure. The trip had been a smashing success. 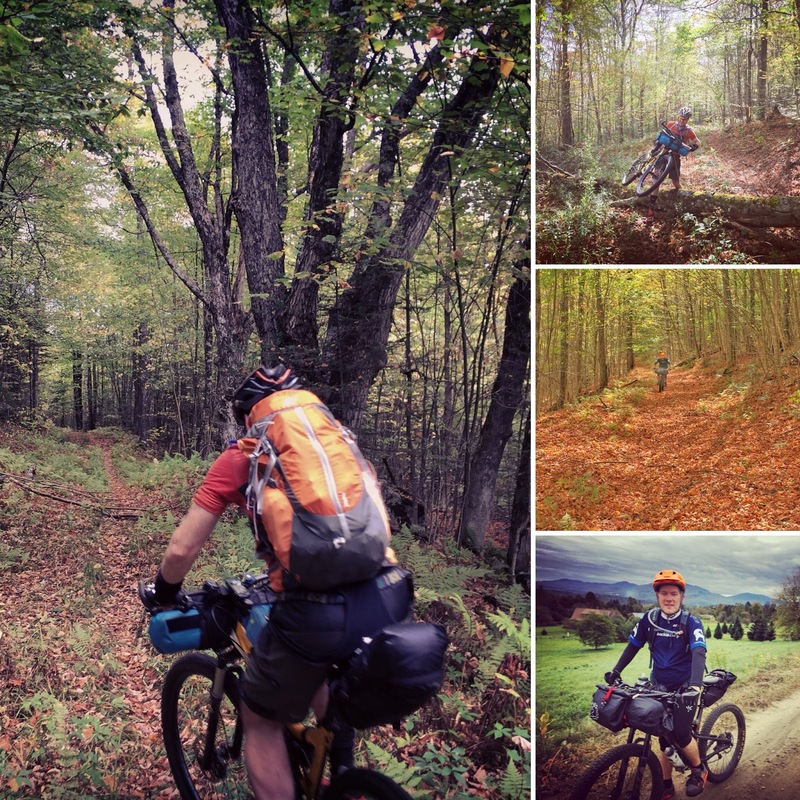 Some blind luck, some help from friends and the flexibility of bikepacking had all helped things come together seamlessly. From the bike, to a new backpack, to the food choices, to the last-minute route- even sleeping in a hammock for the first time- had all panned out. And now I've got the fever. Awesome ride and story! Well done Andy!